A pic of my out-of-shape weights. There's a squirt of iron-y there somewhere. cool shot kali - I didn't get a chance to vote on this one but you would have gotten a good score from me - I don't think that there is anyone voting who can't relate to fitness "intentions" gone "rusted". the one you got was down right RUDE, I hope he/she gets kicked off...no place for that here, don't get discouraged from stupid people - your're on my favorites list cuz your good! Anyways, just going through the aforementioned list tryin' to keep up with everyones work, and thought I drop my two cents on your pic. I think its technically very sound and can't really think of anything that could be better - Nice work. Very ironic. I think this shot would have benefitted from greater depth of field, or a main focus on the word barbell if that was not possible. I do see the iron here, but where is the irony? Good technical quality. 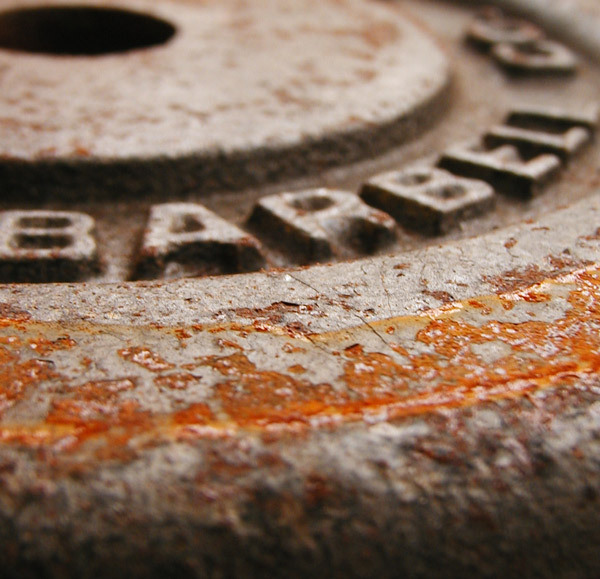 The rusted barbell weight makes a good subject. Your use of DOF is common with this type of closeup, though I generally don't prefer the center focused variety like this. Putting the exact center of the barbell hole exactly at the upper left corner might add a touch to this very nice shot. I like the composition alot. Great depth of field, good detail. Good macro with a very very shallow DOF. The main focal point is only about a centimeter wide. Nice effect..
Nice one! I love the focus and the irony. Proudly hosted by Sargasso Networks. Current Server Time: 04/20/2019 02:57:46 PM EDT.